Something needs to be done to discredit and turn the American people against the Obama-Congressional Democratic agenda. I believe an aggressive campaign that defines the Obama-Democratic agenda as “Not the American Way” would be an effective and succinct way to defeat their un-American plans. It would be a simple way to contrast their socialist agenda with the conservative American agenda that favors individual Americans as opposed to a bigger, more powerful government. It could help change public opinion against their agenda, their party and their candidates in 2010 and 2012. And it would provide a unified rallying cry that all conservatives could get behind and support. 1. Bailouts For Corporations Is Not The American Way. 2. Earmarks (Pork Barrel Spending) For Politicians’ Special Projects Is Not The American Way. 3. Imposing Socialist Healthcare On The American People Through The Budget, Not By The Legislative Process, Is Not The American Way. 4. Imposing Excessively High Taxes On The American People Is Not The American Way. 5. Not Protecting American Citizens Against Terrorism Is Not The American Way. 6. Making The Federal Budget A Higher Priority Than The Individual Budgets of American Citizens Is Not The American Way. 7. Obama’s firing of General Motors Chief Executive Rick Wagoner Is Not The American Way. If you agree this campaign has merit, I hope you will use the “Not The American Way” slogan at every opportunity. I have no proprietary claims on this slogan. My only desire is for the Obama-Democratic agenda to be defeated and to be replaced by proven conservative principles. Working people nationwide are signing petitions, and making calls to tell their U.S. Senators, letting them know that they deserve the right to a secret ballot regarding union elections. It's just plain wrong for a worker or group of workers to pressure others, and then force them to openly vote a certain way. That removes a key value our forefathers fought and died for. During the Presidents' Day holiday, the NC Chapter of the Americans for Prosperity held rallies in Greensboro and in Raleigh, letting junior U.S. Senator Kay Hagan (D-NC) know the facts on the impending card check legislation. Those in Raleigh, stood out in extremely cold weather to make their opinions known! In Greensboro, Rep. Howard Coble (R-NC, 6th District) excited the faithful and in Raleigh, Senator Richard Burr (R-NC) symbolically "voted in secret" (left). The video below is a synopsis of the events of the two days. Watch closely as you may even find yourself or someone you know. Your blogger did. The events were part of the AFP's "Save my Ballot Tour". Something NEW and frighting is happening in the 'ole North State and conservatives can't just sit back and do nothing! The Unions are on the march in the nation and in North Carolina. We must fight to protect workers' rights in the workplace by keeping the secret ballot for workers who must vote for or against unionization. We must fight collective bargaining for public employees. The NC Americans for Prosperity (AFP) needs YOU to keep our competitive edge by keeping North Carolina a Right to Work State. Join AFP as our national President Tim Phillips kicks off a national Save My Ballot Tour. Raleigh - Tuesday, Feb. 17- 10:30 -12:30 - Rally and Lunch -- SENATOR RICHARD BURR will speak near the beginning of the event. Bicentennial Mall across from the Legislature Bldg. Rain or shine. No cost. Greensboro - Monday, Feb. 16 - 5:30-7:30 - Grassroots Reception -- CONGRESSMAN HOWARD C0BLE will speak. Greensboro Historical Museum --No cost. Register at www.SaveMyBallot.com so we can have an accurate food count. EDITOR'S NOTE: Your blogger support the AFP and their programs and has participated in a number of these rallies. Come out and show your enthusiasm for a great cause. We need you, more, now than ever. Spread the word and tell your friends. According to today's News and Observer, the State Employees Association of North Carolina (SEANC) has gone union. The paper reported that they are now affiliated with the Service Employees International Union (SEIU), a national labor union known to wear purple t-shirts. 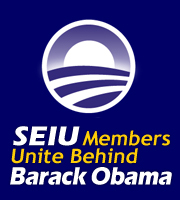 Incidentally, SEIU is backing Barack Hussein Obama. The paper also reports "SEANC hopes to use the resources of SEIU to fight a 1959 law that keeps state workers from bargaining collectively. Currently, North Carolina is the only state in the union that that prohibition." The group, now known as SEANC SEIU Local 2008, doesn't need collective bargaining. These people have jobs that rarely get cut or go away. They are not subject to the market forces such as those who work in the private sector. Your blogger constantly hears state employees complain about what they DON'T have. Their moral is low. These folks could always quit their jobs and work in the private sector like most people, but they feel they must stay to get their full retirement benefits. Having a job you love is much better than working in one you hate for your entire working life. Your blogger was briefly a member of SEANC when she worked at the North Carolina Department of Transportation (DOT) during the Jim Martin administration. A close friend was a team leader in SEANC and convinced KCC to join. Once, your blogger became enlightened on exactly what conservatives were already calling a union, she called DOT payroll to drop out. Your blogger got the typical state government run-around and it took six months to quit SEANC. All the while, they kept drafting their "dues" out of KCC's paycheck. It was maddening. We later found out where our dues had been going. SEANC had a huge yearly party in Charlotte for its leadership, and our money was going to buy booze and other such "fun" for a bunch of Democrat state employees. That, and we got a newsletter. After we were finally removed from the membership rolls, SEANC voted itself the right to endorse candidates, nearly all from that left of center party. Now most elected officials join SEANC right away, so they won't look like Johnny-Come-Latelys when going after the SEANC vote during their re-election campaigns. This is especially true of judicial candidates who must run in non-partisan races. 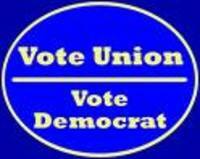 Toss away all your old purple t-shirts and show that you don't support this or any union.